After a week of very strong winds it is finally calm enough to get the plants out into the sun this morning. It is only about 42 degrees, but the perfect opportunity to harden the plants off some and get them some full spectrum sunlight. Today is going to be a beautiful day in Denver, with highs around 80 degrees. 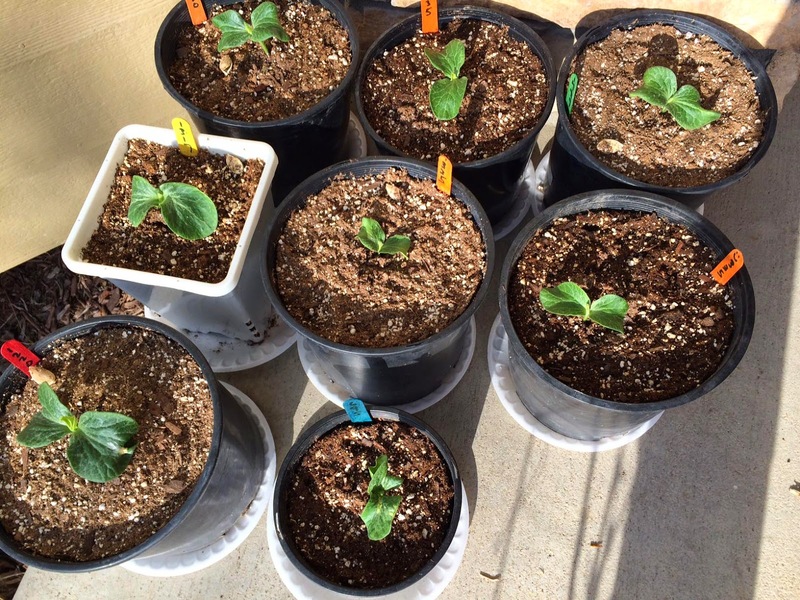 I've put the pumpkin plants (pictured below) into the sun for the first time this morning so that they could start getting used to it's intensity. Pictured below are the plants from top left to bottom: 1220 Johnson, 335 Scherber, 1791 Holland, 1317 Clements, 335 Scherber, 335 Scherber, 1220 Johnson and 695 Johnson. Not pictured are the 228 Scherber and a second 1317 Clements. Those three seeds are just popping through the soil now. Every seed ended up germinating. Some were just real slow this year for some reason. During the off season I got some new grow lights for Christmas which has allowed me to start even more plants this year. As of today all of the seeds that I started on Tuesday have popped through the soil expect for three and two of those three I know germinated so it looks like we are in very good shape. Pictured below is my light setup. I start the seeds on some shelves in a closet. On one half of the closet I've got 4 florescent bulbs with three full spectrum bulbs that are in brooders on the side. This gives plenty of light to the plants as long as I keep the florescent bulbs within about 4 inches of the plants. On the other half of the closet I have one T5 bulb and two cfl bulbs with brooders. These setup is new but seems like it should work well. At the bottom of the closet is a thermostatically controlled space heater. On the plants level this keeps the plants at about 85 degrees which is just about right. So far I haven't tripped a breaker. Keeping the fingers crossed. Today I am attempting to germinate my 119 Johnson seeds. Three previous attempts to germinate this seed during the winter failed. 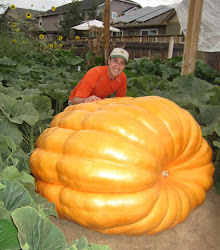 The 119 Johnson is a late season cross of my plant that grew my 1,220 pound pumpkin with the plant that grew the world record 2,009 pound pumpkin. I think it is a fantastic cross. Problem is that when the frost hit the pumpkin was young and although there was lots of seeds, the seeds hadn't fully filled out. At first appearance they look fully formed but they are light. Joe was kind enough to offer me some gibberellic acid to help jump start the germinating process. 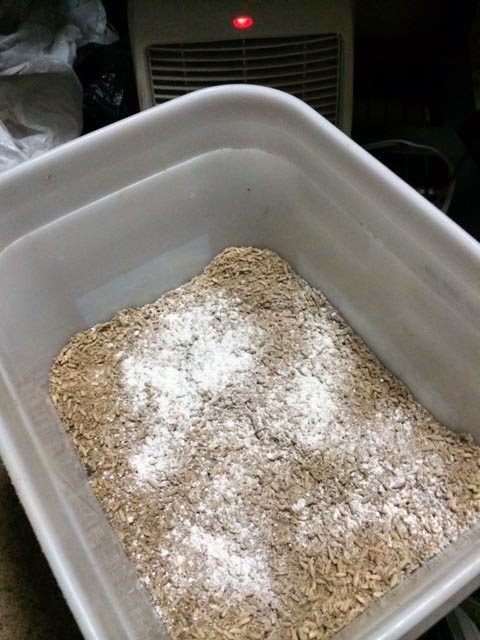 I mixed that with a little alcohol (it needs a solvent in order to mix with water), humic acid, fulvic acid and a touch of liquid seaweed and then put that in water and let the first group of seeds soak for about 2 1/2 hours and the 2nd group of seeds soak for about 4 1/2 hours. I then wrapped the seeds in a lightly moist paper towel, put the paper towels in zip lock bags and put the seeds in a warm place (about 85 degrees). Hopefully in the next 5 days some of them will germinate. If they do I will grow that seed for sure as long as the plants don't look like duds. So far every seed I've tried to start has germinated except for the 1791 Holland seed. I went ahead and removed that seed from the paper towel and put in its pot. I'm hoping that in about 5 days I'll see some signs of life. Ideally you want your soil to be nice and warm for when you plant your pumpkin plants into the garden. Cold soils will stunt the growth of the roots and can make it difficult for the plants to get at nutrients. probably the best way to warm the soil is heating coils, but I don't have any of those. So what I do is put down plastic over the planting area a couple of weeks prior to planting to help get the soil warmed up. It will also keep the planting area relatively dry so when it comes time to put the plants in the ground you don't get caught with a muddy patch of soil to put your plants into. Clear plastic works best I think to warm the soil. It won't get overly hot like black plastic which could start killing the biology in the soil, but should keep it at a nice moderate temperature. I'm planting a cover crop in the next couple of days. The winter rye I'm planting is very hardy, but to help ensure a higher germination rate I'm following a process I've done a few times before. This process also works very well for lawn seed. Take a bucket and put enough sand into it that once you mix the seed and sand together everything will be covered. Then add a little humic acid (1/2 cup maybe), Azos (tablespoon) and mix that together. Then add your grass seed and mix again. Lastly pour water so that there is enough that the entire mixture is lightly wet. Put the bucket in a warm place in the house (maybe next to a heater event). 24 hours later plant/boadcast your seed into the soil. Doing this will get you a much higher germination rate and the seed will start growing much faster. When I did this in the fall I had roots 48 hours after planting. It never really feels like the season has started until the pumpkin patch is tilled. I did just that today. Next step: start the seeds on April 15th. Today I tilled in about 70lbs gypsum, 2lbs kelp meal, 4 bails of peat moss, 2lbs sugar, manganese, 20lbs humid acid and 20lbs azomite. The soil looked very good. 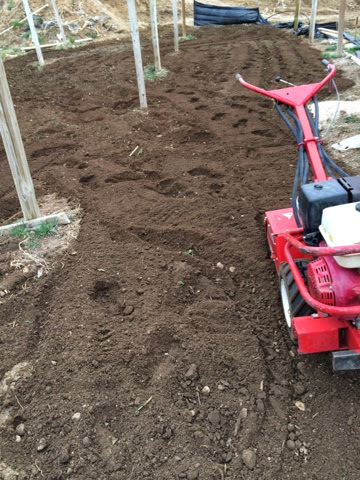 In the next few days I'll plant a cover crop of winter rye in all but the planting area. That will be tilled under in June when the vines start running. I'm frequently asked what you should feed a giant pumpkin. Good soil is the key. To get a good soil built up takes a little time and a soil test. The soil test will tell you exactly what the soil has and what it needs. What should a good soil have? These numbers are based on averages from patches that have grown pumpkins 1,200 to 1,800 pounds in recent years. Giant pumpkin plants seem to however do quite well in wider ranges of soil nutrients than some other plants and can take what they need. However if you have a well balanced soil it will go a long way in growing a new state record.